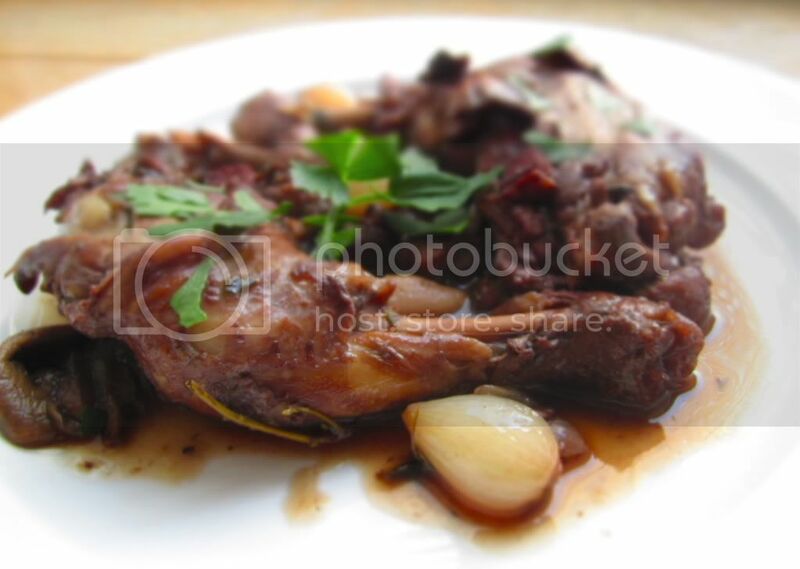 The first time I had coq au vin was in the summer of 2001. I was a junior in college, subletting my very first Manhattan apartment during a searingly hot June. I lived in a tiny studio with a daybed on Park Avenue and spent my days wandering the streets getting to know the city I knew I would eventually live in. I ate dinner in the back garden of Raoul's for the first time. I went to Sunday matinees at the Angelika. I discovered the difference in pronunciation between Houston, the city, and Houston, the street. I drank espressos alone in coffee shops, lingering over whichever novel I happened to be in the middle of. It was all very grown-up. Also, I was completely, head-over-heels in love. I was in the kind of relationship that only seems to exist in that pre-real-world bubble of classes and free time and baggage-less infatuation. He was an amalgamation of startlingly good genes, starting with his height, winning grin, and mop of messy brown hair, and ending with his intelligence and affinity for the written word. He was a college athlete who wanted to become a novelist. It was (at the time) my personal zenith when it came to men. And we worshiped each other. It would eventually come to an unseemly end, as most college relationships do, but for that summer, we were inseparable. He shared my love of food, so we spent a lot of our time tucked into little corner booths eating slow, lingering dinners. Among the most memorable of these was one that took place in a tiny little french restaurant hidden on the second floor of a nondescript building on Lexington. I've forgotten the name of it by now, and I imagine it may have since closed, but I'll always remember the coq au vin that the chef brought to the table himself, tender chicken legs cloaked in a silky red wine sauce, all of it cradled in a small, black cast-iron casserole. Soak the porcini mushrooms in hot water to cover while you proceed with the recipe. Put the bacon in a large, deep skillet that can accommodate the chicken and later be covered; turn the heat to medium high. Cook, stirring occasionally, until the bacon gives up its fat and becomes brown and crisp, about 10 minutes. Add the onions, button mushrooms, and chicken, skin-side down, and brown the chicken well, rotating and turning the pieces about 5 minutes in; the process will take about 10 minutes total. About halfway through this period, add the garlic and sprinkle the chicken with salt and pepper. Pour or spoon off any excess fat and add the stock and the wine, along with the herbs. Adjust the heat so that the mixture bubbles gently but steadily, and cover. Cook about 20 minutes, or until the chicken is tender and cooked through; the bird is done when an instant-read thermometer inserted into the thickest part of the thigh reads 155 degrees to 165 degrees. Remove the chicken to a platter and keep warm. Drain the porcini, add them, and turn the heat to high (if you like, strain the mushroom soaking liquid and add that, too). Boil until the mixture is reduced by about three-fourths and becomes fairly thick and saucy. Lower the heat, stir in the butter, and return the chicken to the pan, just to reheat a bit and coat with the sauce. Taste and adjust seasoning if necessary, then garnish and serve. Beautiful post on so many levels. I've never tried Bittman's version (I use a hybrid Barefoot + Julia Child recipe), but I'm so tempted to now. I may have to use pre-peeled frozen cippolinis though!